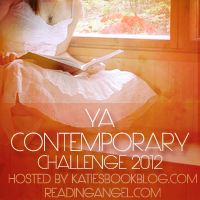 The 2012 YA Contemporary Challenge is hosted by Reading Angel and Katie's Book Blog. I love contemporary YA books, and imagine my surprise and squee-inducing glee when I noticed my book, Blue Sky Days, on the GoodReads list for this challenge! So here's the deal - it's very simple - pick a level (number of books to read), write a blog post stating your intention to participate, and link it up on the linky at the hosts' blogs. You can read any YA contemporary book that's published in 2012. I'm committing to Level 2 - 10+ books. There are so many contemporary YA books coming out in 2012 that look fantastic, so I'm sure it won't be difficult! I'm not going to pick my choices right now, because it'll depend on if the books are available at the library, if I happen to win them, or if I can afford to buy them, but there are a ton on the GoodReads list that I'm dying to read. I'll make a list on my Challenges tab at the top of the blog at the beginning of 2012 and keep track of my progress there! Let me know if you're participating so I can visit you and we can cheer each other on!